Briar Rose is a romantic, ocean view, second floor room with dramatic, high vaulted ceilings. Its private balcony overlooking the gardens, grazing llamas and the sea is accessed through French doors, which bring light and air to this already open and spacious room. A newly remodeled bathroom with marble shower and surfaces awaits. Briar Rose has a classic king-sized iron bed that faces a corner tile-hearthed wood-burning fireplace. The seating area is cozy for reading and watching the fire, and the dining table is large enough to hold your breakfast basket when it arrives each morning. We recommend leaving the in-room desk for tasks such as writing postcards, and we hope you leave any work at home! The private bath has a marble tiled shower, chrome finishes, and is well lit by the overhead skylight. We know you'll love this private romantic room. Your room includes a three-course, hot, in-room breakfast using our farm-raised chicken eggs, fruit, and homemade baked goods, with organic fresh squeezed orange juice and coffee or tea PLUS a complimentary wine & hors d'oeuvres hour in the Wine Bar[n]. 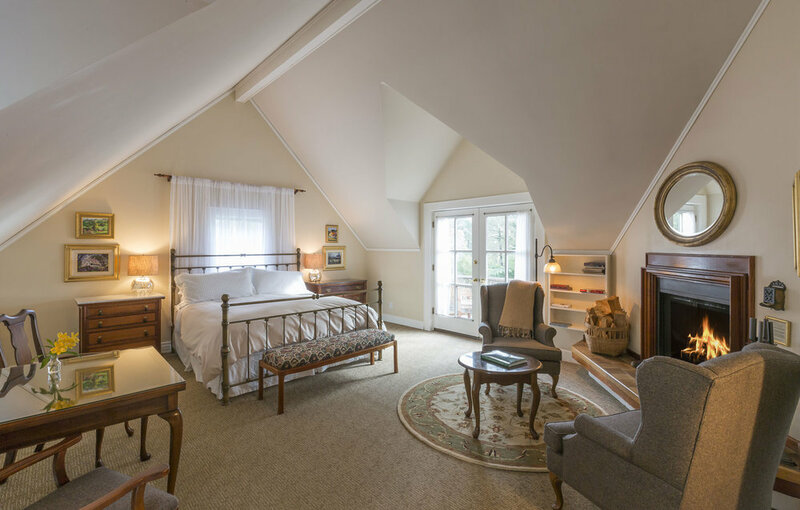 For no additional fee, enjoy free Wi-fi, the San Francisco Chronicle on your doorstep, endless homemade baked goods with coffee and teas, hiking trails, and you can walk the pastures with the inn's animals and enjoy the manicured (and edible) gardens. Come experience the natural beauty of the Glendeven Inn, a Bed and Breakfast in Mendocino like no other. Find out why our Mendocino Inn is rated #1 on TripAdvisor. Reserve today. Learn about our other Mendocino Accommodations. In addition to these amenities (including in-room 3-course hot breakfast daily and a complimentary wine hour,) this room offers a plush feather king bed with buttery linens, lots of light with windows, skylights, French doors and vaulted ceilings, fine antiques, a wood-burning fireplace, private balcony overlooking gardens, and a private tiled bathroom.